NEW YORK CITY, New York — Republican presidential nominee Donald Trump has taken the lead in the latest poll out of the battleground state of Virginia, with his Democrat rival Hillary Clinton slipping 15 points in a month. 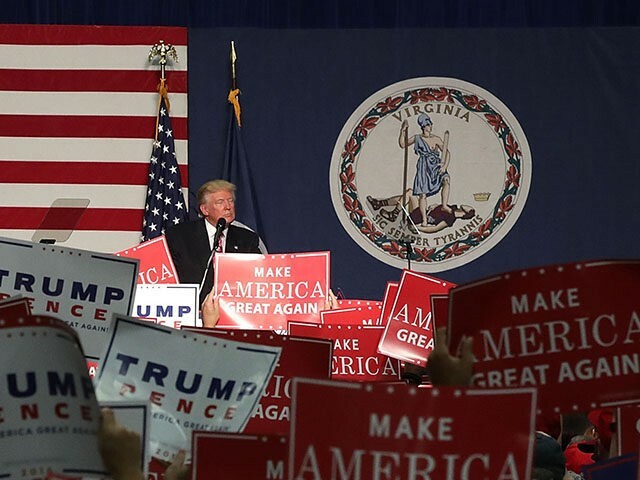 The Hampton University Center for Public Policy (CPP) poll out on Wednesday afternoon shows that Trump has taken a three-point lead over Clinton in the Old Dominion, inside the poll’s margin of error of 4.57 percent. The survey of 802 Virginians, taken from Oct. 26 through Oct. 30—meaning it was conducted both before and after the FBI announced its reopening of the criminal investigation into Hillary Clinton’s illicit home brew email server—found Trump at 44 percent and Clinton at 41 percent. A release from the University notes that Trump had already started closing the gap in Virginia before FBI director James Comey’s announcement, in his letter to Congress, but that Clinton was ahead by a small margin then. It was after the FBI announcement that the bottom dropped out of Clinton’s campaign in Virginia, boosting Trump way over her. After the FBI email news story, the numbers changed dramatically, and following the five day tally, Clinton now trails Republican presidential nominee Donald Trump by three percentage points. It must be noted that this poll began on the evening of Wednesday, October 26th and in the two days of data collection before the FBI email news story, the majority of interviews were completed. In that time, the data reflected a slim lead for Clinton over Trump (43% to 42% with 15% undecided). In the three days of data collection after the news, 257 interviews were conducted which reflected a wider Trump lead over Clinton of 48% to 39% with 13% as yet undecided. After all of the numbers from the 5 day poll were added, averaged and weighted, the total puts Trump ahead. Overall, this is a 15-point swing away from Clinton towards Trump from the most recent previous Hampton University CPP poll conducted back in late September and early October, where Clinton was up 12 points. A Trump aide told Breitbart News this week that it seems like Virginia is definitely in play. This individual highlighted previous election cycles — Ken Cuccinelli’s run for governor and Ed Gillespie’s run for Senate — where polls underestimated Republican candidates in both cycles. Now that Trump has pulled into the lead in Virginia, a five-alarm fire alarm is surely going off in Clinton’s campaign headquarters in Brooklyn. In fact, before this poll came back, Clinton’s campaign changed up the candidate’s schedule to deploy her to Michigan—another state that has gone blue in the last several presidential elections but seems to be trending towards Trump—and announced new six-figure ad buys in many blue-leaning states, including Virginia. If Trump locks down Virginia’s 13 electoral votes, Clinton’s firewall for the White House is significantly diminished, and he is well on his way to becoming the next president of the United States. Trump has already now pulled ahead in Florida, Ohio, North Carolina, Nevada, Iowa, and more. Winning those, plus the red states and Virginia, would ensure Trump the White House with a comfortable win well above 270 electoral votes and many more states like Michigan, New Mexico, New Hampshire, Maine’s second congressional district, Colorado, Wisconsin, Minnesota, Pennsylvania and more still in play on the chessboard. The fact that Virginia is back in contention this late in the game, after Clinton previously thought she had it locked in, is particularly embarrassing for her running mate. Sen. Tim Kaine (D-VA), who once served as the state’s governor. Kaine has been a lackluster vice presidential candidate who, after a poor showing in the vice presidential debate against Mike Pence in Virginia, has canceled rallies after generating embarrassing headlines with his small crowd sizes. Other recent surveys have also shown Virginia tightening, and it is ultimately unclear exactly what will happen on election day. But if past is prologue—looking back in recent years at the polling in both the Cuccinelli and Gillespie races versus the actual results—then this contest is coming down to the wire between Trump and Clinton in the Old Dominion.